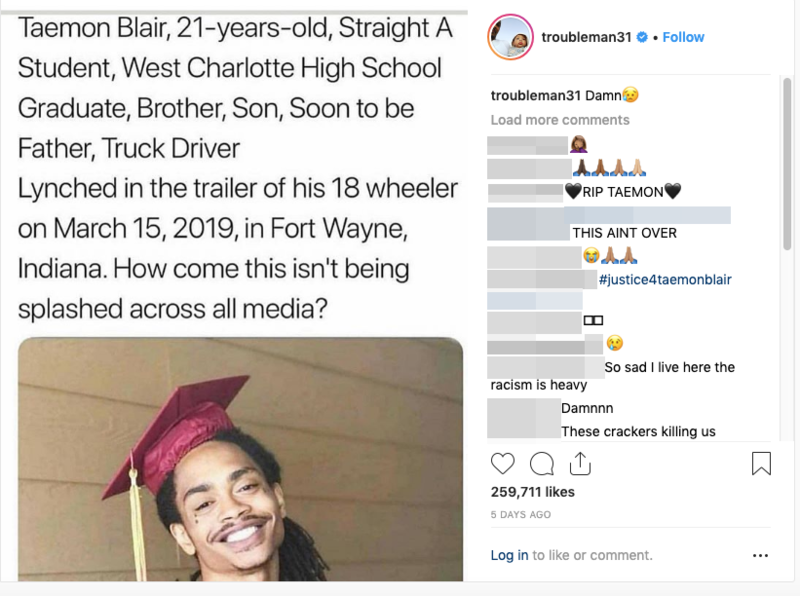 The 21-year-old from Huntersville, North Carolina, was found hanged in his own truck in Fort Wayne, Indiana, on 14 March. 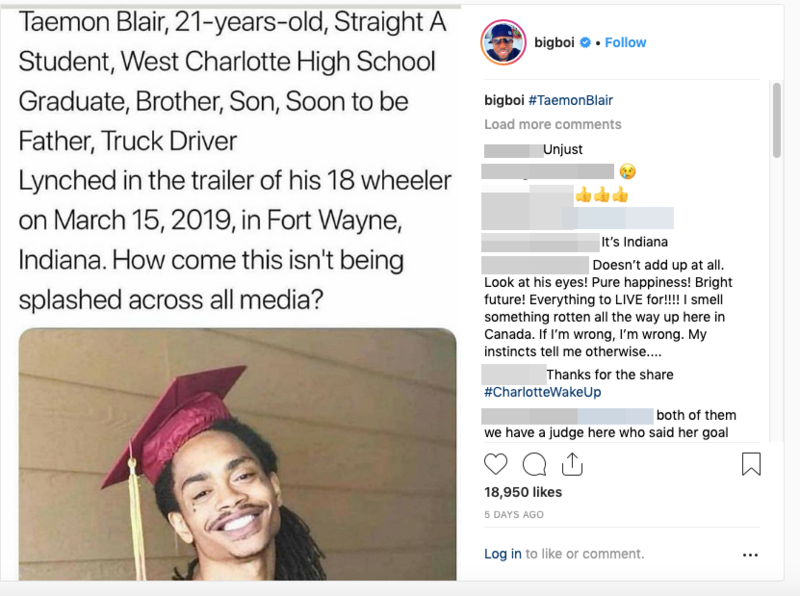 The Allen County Coroner’s Office in Indiana has taken the somewhat unusual step of publicly refuting viral social media rumors about the death of Taemon Blair, a North Carolina man who was found hanged in his semi-tractor trailer in Fort Wayne on 14 March 2019. Police and the coroner’s office in Allen County determined that Blair had died by suicide, but family and friends of the 21-year-old Huntersville man have been steadfast in asking that police conduct a longer, more detailed investigation into the circumstances surrounding his death. In recent weeks, influential celebrities including the rappers Big Boi and T.I. have fueled viral social media speculation that Blair was the victim of a brutal, racially motivated attack, with others claiming that Blair had been found with his hands bound. Blair’s mother, Taesha Hunt, even claimed that she had received a phone call from an unnamed detective in Indiana. The detective allegedly informed her that he suspected foul play in her son’s death and had seen evidence of damage to the truck’s dashboard consistent with a struggle having taken place there, as well as evidence of lacerations to his neck, rather than the ligature wounds typical of hanging victims. Based on information taken from the GPS unit in Blair’s semi-tractor trailer, he left Falls Creek, Pennsylvania, at 12:19 p.m., Central time, on 13 March 2019, driving through Ohio and reaching his intended destination of Fort Wayne, Indiana, at 6:57 p.m. the same day. Blair’s vehicle arrived at a business in the 9100 block of Bluffton Road in Fort Wayne at 7:29 p.m.
Around 11:40 a.m. on 14 March, emergency services received a 911 call from an employee of the business where Blair had parked his truck the night before, who had discovered Blair’s lifeless body in the sleeper compartment of his truck. According to the account the employee gave to police, the employee saw the truck in the driveway of the business at 6:50 a.m. that morning, then attempted to talk to its occupant at 7:45 a.m. but received no response when he knocked on the door of the truck. The employee tried again at 11:35 a.m., this time opening the driver’s door and making noise in an attempt to rouse the occupant. When that did not work, the employee opened the curtain between the truck’s cab and sleeper compartment and discovered Blair’s body in the sleeper compartment. The employee checked for a pulse, did not find one, then returned to the business and called 911. Emergency services arrived on the scene at 11:44 a.m., where medics found Blair’s body was cold to the touch and that rigor mortis had begun to set in. He was pronounced dead shortly afterwards. According to a physical examination conducted by a deputy coroner, there were no marks or injuries on Blair’s hands, wrists, or face, no blood or bleeding, and the ligature marks found on his neck were consistent with the ligature used in the hanging. According to the coroner’s office’s statement, there were no signs of a struggle inside the cab or sleeper compartment of the truck. There are numerous reports on social media, Facebook, Twitter, Reddit etc … which should be addressed. 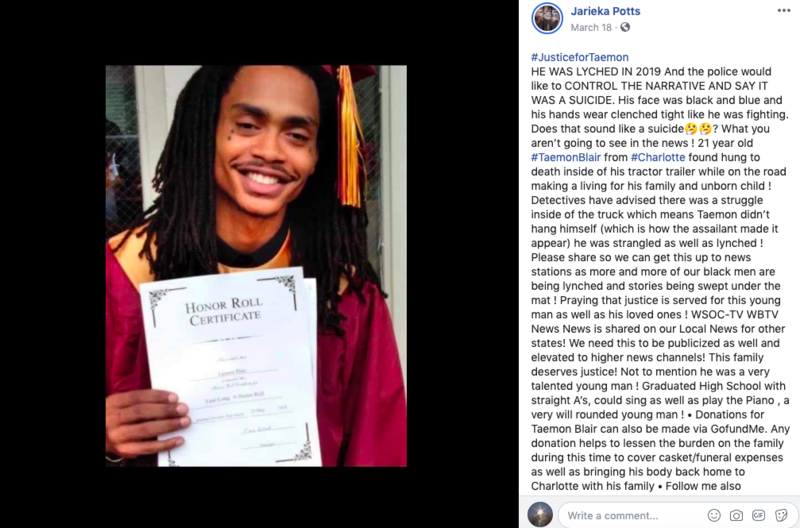 It was reported that Taemon Blair’s hands were tied or bound, there is no reported documentation or photographs which show the hands are tied or were bound. It was reported that Taemon Blair had defensive wounds present, there is no reported documentation or photographs which show any wounds other than the ligature marks on the body of Taemon Blair. There is a report that the dashboard of the truck was caved in from kicking and his leg was broken. In the same posting it is reported that his neck was severed from ear to ear from what looks like fish hooks. There is no reported documentation or photographs which show damage to the interior of the truck or the injuries described in the online post. There is a report where it is stated that the coroner’s office refused the family the opportunity for autopsy, once the body is released to the family they have the option to have an autopsy performed. In this investigation an autopsy was deemed not necessary to determine the cause and manner of death and one was not ordered through the coroner’s office, which is consistent with the protocol and past practice of the office. Mental-health experts advise if you need help, call the National Suicide Prevention Lifeline: 1-800-273-8255. Or contact Crisis Text Line by texting HOME to 741741. Allen County Coroner. 21 March 2019. Allen County Coroner. 28 March 2019.